Coed Varsity Track, Girls Varsity Track · May 20 Girls Track Finishes 12th in the State Track and Field Championships! 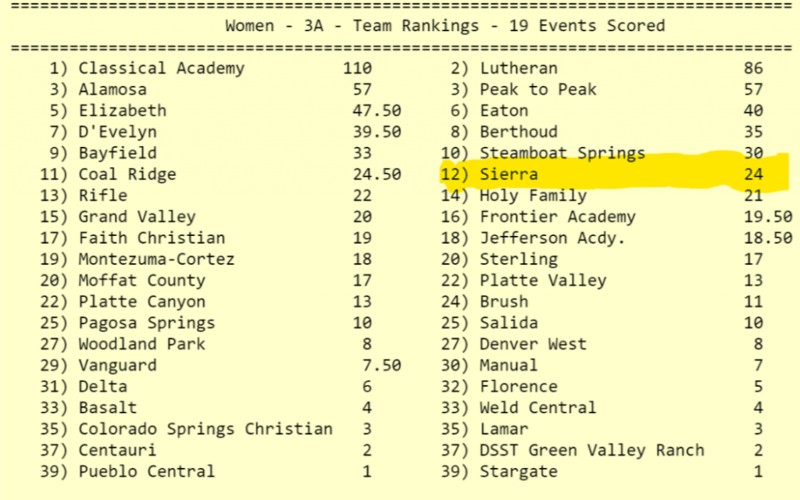 The Sierra Girls Track team had a great showing at the CHSAA State Championships for Track and Field. Out of 40 scored teams in the state championships this year our girls track team finished 12th with 24 total points. With one State Champion in Alexandria Burns in the triple jump, Briyana Bunson finishing 2nd in the 100-meter dash, and our 4×100 team taking 4th place, we were able to showcase tremendous talent in front of the state of Colorado. Stallion Nation couldn’t be more proud of these girls and their accomplishments. In a year were Sierra Track saw 17 athletes qualify for state and over 12 events qualified this was the most in quite some time for Sierra Track which has seen some turn over in coaches. At the helm this year was Amy Dolbeare who has been an assistant coach the past couple of years. With her experience as a teacher and coach, we saw an increase in participation for Track and Field and a historic season for this program. We are looking forward to next year! #GoStallions!